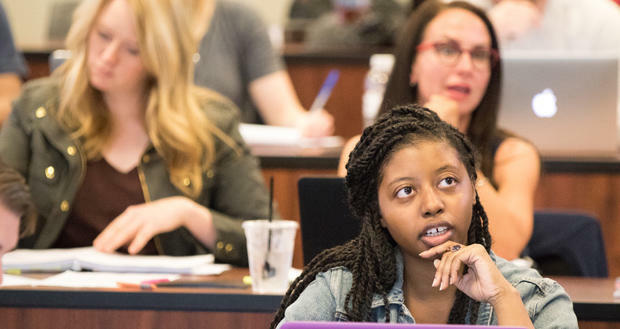 Students listen during a class titled “Land and Lease” at Oklahoma City University’s School of Law in downtown Oklahoma City Monday. Ted Streuli of the Journal Record newspaper talks to KGOU's Jacob McCleland. It’s been nearly 70 years since Ada Lois Sipuel Fisher made history when she became the first African American law student at the University of Oklahoma. Today, there are still few African Americans at law firms. The Journal Record’s Sarah Terry Cobo writes Sipuel Fisher was a pioneer who challenged segregation. The Chickasha native wanted to go to law school. Langston University, a historically black college, didn’t offer a law degree. The local NAACP chapter encouraged Sipuel to apply to OU’s law school and challenge segregation laws. Her case eventually went to the U.S. Supreme Court, where the justices ruled in 1948 that the university had to provide her equal opportunities to secure a legal education, according to the Oklahoma Historical Society. She was admitted in 1949 while OU’s campus was still segregated. African American attorneys still face many challenges, and a nationwide survey found African Americans are the most underrepresented minority group among associates and partners at law firms. Women and black/African-Americans eked out small gains in U.S. law firms in 2016 compared to the prior year, according to the National Association for Law Placement Inc.’s annual diversity report. The number of black/African-American associates at law firms nationwide has declined nearly every year since 2009, except in 2016, when there was a small increase. About 2.76 percent of partners in 2016 were minority women, and they continue to be the most underrepresented group among partners nationwide. Only 1.81 percent of partners are African American. In his weekly conversation with KGOU, Journal Record editor Ted Streuli said the single biggest obstacle is the cost of going to law school. Streuli says some law firms are providing diversity scholarship to Oklahoma’s law schools, and some offer internal training for their attorneys to give them a better frame of reference about the challenges facing minorities. “The American Bar Association has scholarships and professional development conferences to help minority students. And some firms also provide mentors directly to the local law students here to encourage students to keep up their grades,” Streuli said. Jacob McCleland: Ada Lois Sipuel Fisher was the first African American woman to go to law school at the University of Oklahoma. In many ways, the Supreme Court ruling that allowed her admittance to OU was a precursor to Brown v Board of Education. Could you fill us in on a little bit of her story? Ted Streuli: Well, sure. She was a Chickasha native wanted to go to law school. Langston University was where most black students went in those day, but they didn’t offer a law degree. So the local NAACP chapter encouraged her to apply to OU and challenge segregation laws. That case eventually went to the U.S. Supreme Court, where the justices in 1948 ruled that the university had to provide her equal opportunities to secure a legal education. She was admitted to OU’s law school in 1949 while the campus was still segregated. McCleland: That was 7 decades ago, and Journal Record reporter Sarah Terry Cobo reports that African Americans are still underrepresented in law firms. Why is that? Streuli: Well, they really are. The number of African-American associates at law firms nationwide has declined nearly every year since 2009. There was a small increase last year. And less than 2 percent of the partners at law firms are African-American. So one problem for prospective students is there really is a lack of role models and mentors out there. McCleland: What are the challenges that African Americans face today when they want to go to law school? Streuli: The single biggest hurdle is the cost. That’s the number one barrier. Even the admissions process can be expensive. Now, some law schools will waive some of those fees if asked, but a lot of people don’t even know to ask for that kind of assistance. McCleland: What are Oklahoma organizations doing to help more African Americans go to law school and succeed when they get there? Streuli: Some of the law firms, especially the larger ones, provide diversity scholarships to the law schools in Oklahoma. Some are also developing more training internally so that their own attorneys can have a better frame of reference for the challenges that minorities in the profession face. The American Bar Association has scholarships and professional development conferences to help minority students. And some firms also provide mentors directly to the local law students here to encourage students to keep up their grades. McCleland: I want to talk about another Supreme Court case, this one that happened about 30 years ago. This was the case that opened up gaming facilities on tribal land. Journal Record reporter Molly Fleming wrote an article about gaming’s effect on tribes here in Oklahoma. Obviously, gaming remains a big source of revenue for tribes. Is revenue still growing today? Streuli: It sure is. In 2016, Oklahoma collected a record $132 million in exclusivity fees from tribal gaming. That was a 3 percent increase from the year before, so that’s growing faster than the economy. When fees were first collected back in 2006, it was only about a tenth of that, about $14.2 million that came into the state. McCleland: Tying in to our previous discussion about attorneys, how has that Supreme Court case changed how Indian law is practiced? Streuli: Well it’s changed it dramatically. The tribes have become much more sophisticated in that 30 years. The lawyers have become more sophisticated and they’ve told us it’s attracted more people to the law because the field has just expanded enormously. They said easily 20-fold expansion since gaming was approved. McCleland: That’s Ted Streuli. He’s the editor of the Journal Record newspaper. Ted, as always, thank you so much for talking with us today. 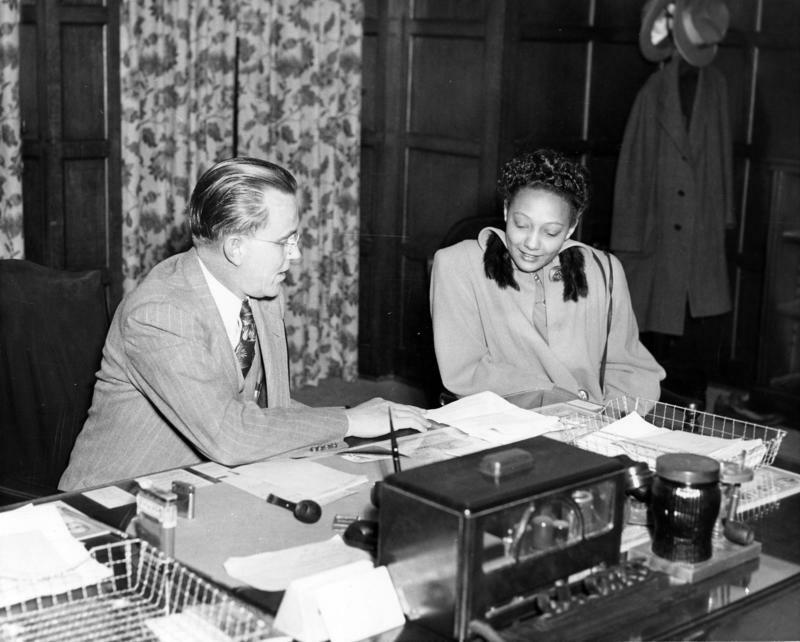 Seventy years ago, a 21-year-old woman named Ada Lois Sipuel Fisher walked into the University of Oklahoma’s admissions office to apply for law school. She was immediately turned down because of the color of her skin. He didn’t agree with the decision, but OU president George Lynn Cross had no choice but to deny the request, since state law mandated the segregation of public educational institutions.